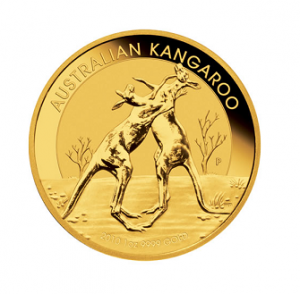 The Australian Gold Kangaroo is a gold bullion coin minted by the Perth Mint. First minted in 1987, this is one of the most popular gold bullion coins in the world. Each coin is 99.99% pure gold, and is shipped from the mint in a round protective case. The obverse of the coin features a portrait of Queen Elizabeth II. Until 1988, the reverse of these coins depicted an Australian gold nugget. Because of this early design theme and the inclusion of the word “Nugget” on the obverse of the coins until 2008, the coin is sometimes known as the “Australian Gold Nugget” coin. This design plan was soon changed; now, the coin features a different kangaroo-related design each year. One of the world’s most popular gold coin series, the Kangaroo is prized by coin collectors and precious metal investors alike. With the images changing each year, the coins have a uniqueness not found with most other gold bullion coins, such as the American Gold Eagle and Canadian Gold Maple Leaf, which have designs that remain the same from year to year. Along with the Chinese Gold Panda, this is one of only two world gold bullion coins to feature a different design each year. The Australian Gold Kangaroo coin is also unique in that it features a proof-like two-tone frosted design effect. The popular 1 troy ounce version of this coin measures 32.1mm in diameter and carries a face value of $100. 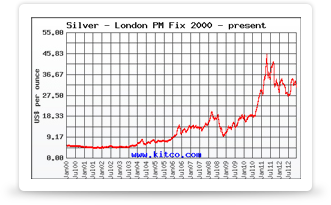 The coin is also available in 1 tonne, 1 kilo, 10 troy ounce, and 2 troy ounce versions for investors interested in acquiring larger amounts of gold bullion. First minted in 1991, the design on these coins stays the same every year, unlike the design of the one-ounce version. 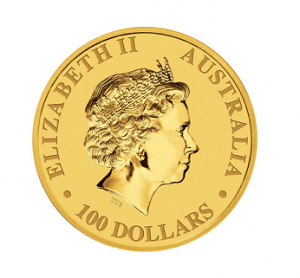 The 1 tonne coin, with a diameter of 80cm and a face value of $1,000,000 AUS, was introduced in 2011 and has been recognized as the world’s largest and most valuable gold bullion coin. At the other end of the scale, the Australian Kangaroo also comes in a number of fractional sizes, such as 1/20, 1/10, ¼, and ½ troy ounce versions. No other government-backed gold bullion coins come in such a wide array of sizes and weights, making the Australian Kangaroo popular among investors who appreciate the flexibility or wish to diversify their portfolio. The price of the gold Kangaroo is based on the spot price of gold, plus a small per-coin premium. The Perth Mint has recently reduced its premiums on the one-ounce Gold Kangaroo, driving up sales and making the Kangaroo one of the best buys in the 99.99% pure gold coin market. Although they are considered legal tender within Australia and are marked with a face value based on the size of the coin, the actual value of the coin is significantly higher than this face value. Because of the relatively low mintage when compared to other gold bullion coins, their numismatic value is often higher than the value of the gold they contain, in contrast to many other gold bullion coins.